Sound View Electronics was founded in 1991 and designed and installed custom entertainment systems for both home and office applications. In 2001, Ron Rego took over the firm and immediately used his background in electronic engineering and computer science to add even more value for its customers. He pushed the limits of design and installation of cutting edge home automation systems and audio and video systems for business and for the burgeoning home market. George Hewitt had his own smart home automation/home theater firm. His background in Electrical Engineering and his MBA in Marketing were the perfect background for growing the business. In 2007, George and Ron decided to join forces to deliver superior custom designed sound systems that were low maintenance and delivered a superior customer experience. The NYC Subway System issued a Request for Proposals in 2000. They wanted an automated announcement system for their escalators that delivered a reliable and easy to understand safety messaging system. We listened, identified the real needs, and developed a new product that delivered the goods! Automated messaging systems on escalators improve subway, bus and train station safety. They also offer new opportunites for advertising. The speakers not only had to be water resistant but the enclosures had to be especially vandal resistant. The amplification system needed to be located in the harsh environment of the escalator pit. That meant it had to operate in the midst of dirt, grime and heavy vibration. The messages had to be crisp and clear even in the cavernous environment of the subways. The system’s prerecorded message had to retain the message even if the power went off and it had to restart automatically when power was restored. Sound View Electronics responded to New York’s request and dug deep into their needs until we fully understood them. To achieve this goal, we utilized our engineering and sound system experience to develop a system that met all of their criteria. By going the extra mile to help the NYC Subway System solve their problem and custom manufacturing a system to meet their needs, we became the only system approved for use in the NYC Subway System. Why? Because we listen and help prospects clearly define their needs, design systems that meet and exceed expectations and deliver the highest levels of customer service. In the end we roll up our sleeves and acquire customers the old fashioned way—we earn them. 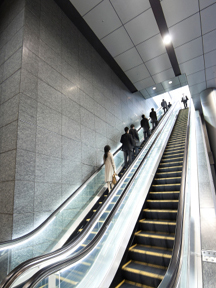 If you are looking to partner with a firm that can design and deliver an automated messaging system for your escalators or moving walkways; a system that delivers very understandable messages in any language, has an amplification system that consistently operates in the harshest environments, has eight different speaker options and can be programmed using multiple messaging options, give us a call. By the way, if you need a company that can think outside of the box to solve your challenges, contact us with your automated messaging needs even if the system is not going to be placed in an escalator or walkway. Over 35 years of IT and computer systems experience and management, 12 years designing premium audio and video systems for commercial and home theater applications. Over 12 years developing and installing Sound Systems for Escalators and Moving Walkways. Education: Bachelor’s in Electrical Engineering, Master’s in Computer Science and an MBA in Finance. Over 30 years of sales and management, 6+ years of designing state-of-the art audio and video systems for commercial and home applications. Over 6 years experience in developing and installing automated Sound Systems for Escalators and Moving Walkways. Education: Bachelor’s in Electrical Engineering and MBA in Marketing.